For four days in March, I watched Norway’s national devil return to public view, in another installment of the courtroom drama familiarly titled Breivik v. State. Andres Behring Breivik, now 37, perpetrated the greatest act of political violence any Nordic country has seen since the end of World War II. After exploding a car bomb outside the prime minister’s office in central Oslo in July 2011, he went to a youth camp where he killed 69 boys and girls. For our own sanity, those of us living in Scandinavian countries with generally trustful relations between people and well-functioning economies and welfare states have wanted to move on from the brutality of attacks like Breivik’s. But every so often there comes an event—the bombings in Brussels this week, for example—that punctures our sense of security. For me, the return of the devil was one of them. It is ironic that Breivik sued the Norwegian government, when families of the victims and survivors of the terrorist attacks have long considered filing their own suits against the state for failing to protect the children and more generally failing to protect its own citizens. The families of the victims have not had the energy to follow up before the courts, and they’ve been trying to get back to the lives they led before the July 22 attacks. But certainly so many things changed with Breivik’s appearance on that clear and sunny summer day in 2011 in this otherwise fortunate corner of the world. Many people described it as a horror movie because it felt so surreal—the sight of Breivik dressed in a police uniform he tailored himself, contradicting the good intentions and camaraderie most Norwegians put their faith in, massacring the brightest of the next generation. This is why he has come to embody the devil himself here. His actions made us realize how ill-prepared we were to deal with this type of evil. When Breivik set off the car bomb in Oslo, only four police officers—out of thousands—were on duty. In downtown Oslo, no obstacles prevented the terrorist from parking his car at the unguarded entry door to the government headquarters. He had plenty of time to drive to Utøya Island and conduct a manhunt against the children attending the Norwegian Labor Party summer camp. Neither a helicopter nor a boat could be organized in advance to stop Breivik’s massacre. At the time of the attack, I myself was celebrating my daughter’s 13th birthday in the Swedish countryside. This peaceful scene was interrupted by a call from my editor at the Swiss Broadcasting Company, where I am the northern European correspondent. “Something strange is happening in Oslo,” she said. And then, for many weeks, I was plunged into a disturbing underworld seething with anti-government, anti-immigrant anger and violence that we hadn’t seen until it boiled over. During the first iteration of Breivik v. State in 2012, I sat through the 10-week-long criminal proceedings at the Oslo Court. To me, his propaganda was as ridiculous as his frightening actions. Breivik said he was fighting to prevent the downfall of Western civilization at the hands of a Muslim takeover. “This country is my prison,” he said. His only regret, stated before the sentencing, was, “I did not succeed in killing even more of those people.” When Breivik got his life sentence on August 24, 2012, I felt relieved. But I did not feel relaxed; I knew that at some point he—or another kind of Breivik—would be back. Breivik himself came back earlier than expected. His challenge against the state interested me because I think all of us, in the aftermath of his actions and sentencing, have wondered whether we have treated him according to the values we hold dear, even if his actions went beyond the limits of reason. Is it possible to deal fairly with a monster? During the last four years, Breivik has basically been in his own prison, as he is deemed to be a danger to others and others are seen as a danger to him. A team of 49 people (including a doctor, a priest and gym coach) is taking care of him. He occupies three rooms: a sleeping room with ensuite shower, a study room with books and a typewriter (Breivik is an accredited student at Oslo University), and a private gym. Breiviks receives about 2,500 letters a year, many of them very long and requiring translation from Russian and other languages. Norwegian taxpayers have picked up the bills for damaged government ministries, new prison construction, lawyers, and translation, which have cost them more than a billion dollars so far. Skien Prison certainly felt like a prison: It had high walls, barbed wire, and control towers. However, there was a certain human touch to it, as all the guards I met were very friendly and welcoming. The sign outside the prison door noted it was a kriminalomsorgen, a ”care center” for criminals. After having suffered from and contributed to the extensive inhumanties of World War II, Norway developed a humane penal code, based on the idea that all wrongdoings can be corrected and every person should have a second chance for a decent life. The prison’s sports hall had been turned into a courtroom for the four-day-proceeding. I could tell that when Breivik walked in, neatly dressed and with a fully shaved skull, he was enjoying being back in the spotlight. I found myself just a few meters behind this man, who by appearance and voice could be any person you might meet on the streets of the wealthy western parts of Oslo, where Breivik grew up. However, it soon became clear how different Breivik was from those people. He started by offering a Hitler greeting to the auditorium and then said to judge Helen Andenæs Sekulic,”I am the secretary general of the Nordic State Party.” A political party that exists only in his shaven head. 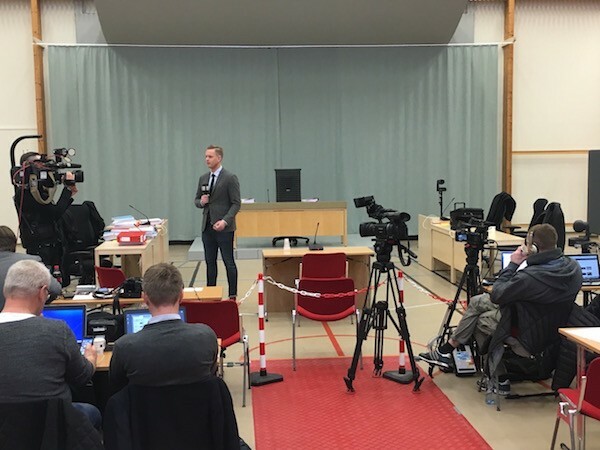 Skien Prison—a Norwegian kriminalomsorgen—converted its sports hall into a makeshift courtroom for the most recent proceedings of Breivik v. State. 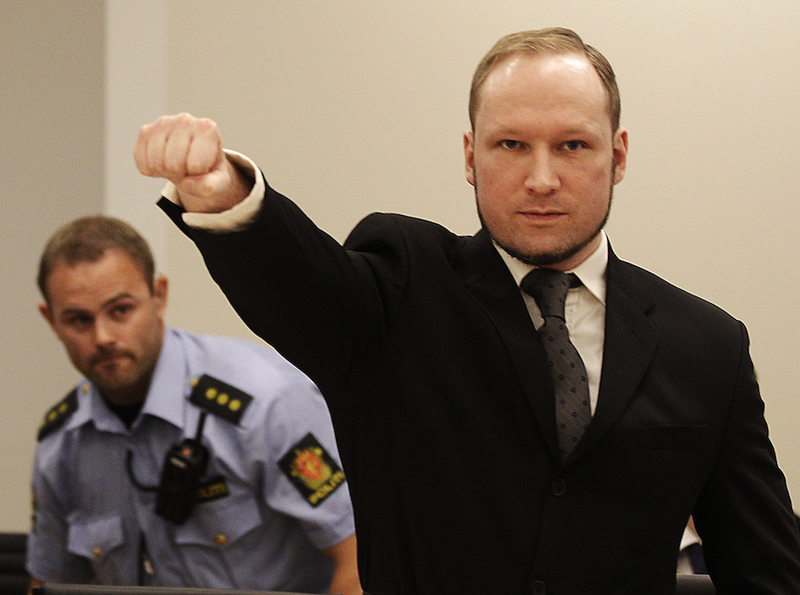 In his three-hour long statement, Breivik compared himself to Hitler, Nelson Mandela, and Abraham Lincoln as “leaders who were ready for violent action when deemed necessary.” He asked the court to relax his prison regimen so he could more easily interact with fascist supporters around the world. The horror movie that unfolded after the attacks was taking a turn towards a farce. Here was a 37-year old terrorist, asking for compassion from a world he had savaged, turning the goodwill of the Norwegian people against them. And he didn’t see the irony. But I understood more of what was at stake when I talked to the father of one of the girls killed on Utöya during a break in the trial. He, and other relatives and survivors, came because they wanted to know that they would be safe from this man. Breivik proved to be worst witness for his own case against the Norwegian state. He verified the shocking fact that yes, there are human beings who are so inhuman that they never ever should be released again. So, when the devil himself got back into his handcuffs on day four of this trial, I was again relieved—the rule of law in Norway was working as it was supposed to. But I was also depressed because I couldn’t recognize anything familiar in this fellow human being. I lost my way after I passed one of the exit checkpoints, ending up in the prison kitchen. There, a smiling cook offered me some fresh coffee and directions for how to get out of the prison. I was so glad to find my way back to a society where there is enough humanity and the ability to learn how to deal with the worst among us. Bruno Kaufmann is the editor of People2Power, a global democracy media initiative hosted by the Swiss Broadcasting Corporation. *Lead photo by Frank Augstein/AP Photo. Interior photo by Bruno Kaufmann.